Does anybody here have the DVDs? Please post your thoughts on it? Early on, when these movies were coming out, I had mined the storylines for plot hooks and adventure driven themes for my games. The funniest result of one is the story of one player who tried to commandeer a speeding truckload of cultists. Alas, he was popped in the face by a cultist with a rifle, failed his climb, and tumbled off the side of the road, down a wooded hillside. Alive but very sore! These are amongst my favourite movies, particularly Raiders of the Lost Ark. There is talk of the fourth Indy film being made, but I'm not sure what it will be like considering how old all the principles are. That last Indy film was made in 1989!. Wathcing Indiana Jones films, and I start thinking I'd like to see a sourcebook for India, China, South America and the Middle East, all places Doctor Jones can be found! PS: On page 114 of the Games Workshop Edition of the Call of Cthulhu rulebook, there is an example of Ohio Jones, using a submachinegun to demonstrate the rules of automatic firing weapons. Perhaps he is a long lost brother, or cousin. I always wondered, "What happened to the Investigator mentioned in earlier Chaosium supplements, the famous Monterey Jack?" I will never look at that cheese in the same way again! I received my DVD set on Saturday morning -- praise be to accidental early deliveries -- and I can highly recommend the 'cleaned up' movies and the three hours of extras on the separate DVD are well worth a view. Talking of the 'bonus' DVD, you get a documentary that is very roughly 2 hours long (40 minutes per film) along with ... 4 or 5 'featurettes' dealing with aspects such as special effects, music (with John Williams) etc. Each featurette is roughly 12 minutes in length. Indeed, John Williams -- in his bonus DVD music bit -- was already excited, thinking about the score for said movie. Trivia: Those of us in the UK get a slightly different version of Temple of Doom to the USA. You may recall the bit with some geezer's heart being pulled out? Well when the film was certified back in 1984 the British Board of Film Censors would only give it a PG rating if the viewage of the heart was removed. When they put the DVD box set together it was decided to give us the movie we were used to -- i.e. the cut version. Frankly I can live without a bit of soggy latex, but it does offend my sense of 'freedom of choice'. I am loving this set. A good box (plus the glue gum on it is really weak, unlike some used that rips the box to shreds ). Plus I get to spend late hours watching Dr. Jones outwit baddies and get magical artifacts (plus I've heard that the YIJ Chronicle set is inthe works now). Along with the 4th, extras, disk, Best Buy is giving a 5th one. It isn't much, but it is a brief documentary about the making of Raiders made back during the films production. It is fun to look at, and will have to compare wha tthey say there with what is on the 4th disk. BTW. If you are really into seeing books dealing with IJ, there wasa a game out for awhile. You should keep your eyes open at ggame shops. I think I have most of the books. There is one for Africa. Their are movie books for Raiders and Temple (with regional data on the places that were visited in the films), an artifacts book, one on the various stops on all the continents, and at least two adventure book that takes place mostly in SF and the other in Scotland (and of course the core book). Oh yeah, their is also a supplment about Japan and what it is up to in the 30's. They are good books for adding bits of myth and occult, plus period info on the world abroad. BTW. If you are really into seeing books dealing with IJ, there was a game out for awhile. Two games actually. TSR had the licence in the mid 80's and released a handful of books. Most of the adventures for it were in solo format. The whole line was legendarily bad, and TSR ended up burning much of their unsaleable inventory. The second version was released by West End Games in the mid to late 90's as part of their 'Masterbook' D6 series of world supplements. Never managed to get hold of any, but the reviews were always reasonably complementary. For a tenuous Cthulhu link, there were also a couple of Masterbook supplements based on Brian Lumley's Necroscope series. "Monty" was my PC in a bunch of Sandy's games back in the early 80's... notorious for being far too inquisitive, and prone to fits of insanity, he never lasted more than a few weeks into any campaign. I can probably dig his stats up if anyone's interested. Ok so my life is a very sad, peculiar one, but a two-fisted, pulp hero named Monterey Jack was famous in our games. Please post him! What? Was he named after the cat or something? The Joneses and their wacky state named pets and children-nicknamed-after-pets syndrome. would that be a sign of insanity from a parent? Maybe all those cultists are digging in the wrong place? Mental Disorders: Necrophobia, Pyrophobia, Entomophobia, Etc. I go tthose Westend D6 books. I'll have to look out for those Necroscope ones and look 'em over. Hmm, Monterey Jack (not to be confused with the Rescue Rangers). Maybe we should plead with Stuart Gordon to make a Cthulhu Pulp film, "Monterey Jack and the Last SAN Point". I'll have to look out for those Necroscope ones and look 'em over. This is terrific stuff. I need time to digest what I'm reading, but what's his history? How? What? Where? Why? When? And how did you decide that you would name him Monterey Jack? I forgot about this cartoon! I don't know. With a SAN of 12. How far off is walking around naked, with unblinking eyes, rigid smile. a backwards cap, and a case of sardines. Yeah, I could imagine that happening. Monterey Jack was my PC when I first started playing Cthulhu back in 1982. He was an obvious ripoff of Indiana Jones, and, as I was 13 at the time, I never really developed much of a backstory for him. It was enough to just know he was a college professor of Archeology at MU and he had a bullwhip and was "cool." He was well-known in our group for going mad at the drop of a hat (mostly due to my complete inability to roll dice well). As such, he was a great "catalyst" for adventure sessions. He was fascinated with the mythos, so would gather all these tidbits, then assemble a team and lead them into the unknown. He always wanted to "find out more" so as soon as there was a hint of a monster, he'd charge right in, see it, go insane, and then I'd bring in my backup PC. He also lasted about two minutes into Masks of Nyarlathotep. And of course Sandy's infamous "Moth Man" scenario... I think he lasted up until the "flogging" scene, then went nuts... He led a team back there many years later, and encountered some sort of monstrous jereusalem cricket beastie in the coal mine... and went nuts... You'll have to ask Sandy about that one... I'll see if I can scare him up. Monty fought Dracula in the Carpathian mountains, alongside Sherlock Holmes in a scenario run by Larry DiTillio at a convention... all sorts of other wacky shennanigans as well. Plenty of other great adventures as well. I still keep his sheet around in case I ever get to play another 1920's era adventure. As far as notable appearances in gaming books, he was mentioned in half a dozen Cthulhu books, as well as being one of the 6 main characters in Arkham Horror, and I beleive even got a mention in the Ghostbusters RPG. Obviously that must have been his grandson or something. As far as the name goes... well, I grew up in the San Francisco Bay Area, found some Monterey Jack cheese in the fridge one day and thought that'd be a funny name for an Indiana Jones parody... it stuck... Originally, it was just Monterey Jack, but then one of "The Guys" pointed out that that was a dumb name, because Jack was a first name. So Sandy and I conferred and came up with the last name Terwilliger (from "The 5,000 Fingers of Dr. T") which we agreed was the worst name ever, and would explain why he never used it. Why only last night Monterey Jack and Co were victorious against the Mythos and MJ became 'First Citizen of Arkham' as I had the largest pile of destroyed gates - yes it was Arkham Horror - we're revving up for Halloween next week! Monterey Jack was a great character. 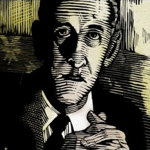 He was seminal in the early development of Call of Cthulhu as a character who didn't seem to mind increasing his Mythos skill. I don't recall him having a SAN of 12 during any active game we did - perhaps it had dropped to that point after his latest adventure or something. Normally, when an adventure would start, we would just assume that "Monty" had just finished his latest bout of years of therapy and hso got to start out with his maximum possible SAN. Which, since his Cthulhu Mythos was 56, gave him a puny 43. Combine his low SAN with Ben's pathological inability to roll dice and we were all looking forward to what Monty would pull off in any given adventure. I recall him once using his whip to inadvertently snag a burning stick of dynamite in a cultist's hand and yank it to himself. The whole party had to leap for cover as the dynamite exploded in their midst. I also have vague memories of him trying to "ride" a hostile Hunting Horror, but maybe that was another PC. Our official house rule for playing Monterey Jack in Arkham Horror are that he always starts off with 3 SAN and 7 STR. Hey Ben, do you know the stories behind any of the other Arkham Horror characters? Proof again, that just because your PC cansnatch things out of cultists hands with a bullwhip, doesn't mean he should. As far as the riding of the hunting horror... I don't remember that exactly, but it sounds like something he'd have done. I do remember in the RQ game, my PC "Jihad" was well-known for using "The Tactic" as we called it. He'd jump up on the backs of huge monsters and stab them in the head with his sword until they died. Surprisingly it worked more often than you'd think. The ultimate, of course, was when he climbed on the back of that centaur/wyvern/scorpion thingy... The stupid beast tried to zap Jihad with it's poison stinger, only to roll a fumble and "hit self in head, do critical damage." I remember Sandy just about falling off the chair laughing at that one... We were all mightily impressed. Monty did you proud last night a true tour-de-force performance! Stacked to the gills with magic and mayhem. The game definitely works better with many players. Speaking of MJ - perhaps he would like to appear as a celebrity guest in the new Character Repository facility we're developing for Yog-Sothoth? - and in the meantime I'd be very curious to see a scan of his original character sheet! You know I hate most boardgames (and card and dice games). I find them too boringly restrictive compared to RPGs, just piles of rules and restrictions, not enough room for imagination or creativity. But Arkham Horror is one of the exceptions, partly because the setting is so evocative, partly because the gameplay is such merry mayhem, and partly because it appeals to the nihilist in me: gotta love a game where it's possible for everyone to lose - the horrible things from another dimension break through, and everything is destroyed! Sadly, I don't have his original sheet any more. I found him in my old character binder last winter, and transferred him to Byakhee format. I'm pretty sure I threw out the original sheet after printing the new one. Never thought anyone would be interested in seeing it. Sorry, no clue on the rest of them. I beleive that when Chaosium first got the test copy, they were all named. Sandy renamed one of them to Monterey Jack before the game was published. Conversely, we had this crazy guy that used to hang out in the neighborhood around Chaosium. He used to bring us all kinds of wierd crap to try and sell. Cans of spray paint, bottles of stamp ink, motorbike spedometers... We never actually knew his name, but Charlie started calling him "Abner Weems" after one of the non-player characters in AH. I don't remember where he was on the board, but if you went to Abner, you could buy a random thing out of the "item deck" from him. Your chances of him having an Elder Sign were about as good as him having a gun, first aid kit, etc. One of the few rewards of being a corporate whore I got to outbid the several other people who wanted the near-mint copy that I landed a few years back. I think the bidding finished up at $160 or $170, which I condered fair since the copy was pristine. The pieces had been punched out, but the game had never been played. I didn't think that such a perfect copy would exist at that point in time (what, 20 years after its release? ).